It's 8 a.m. on a Friday morning, and Richard Forbus, along with 22 other homeless men and three homeless women, are making their way from the small waiting room of Good Samaritan Homeless Clinic, past a security guard and down the hall to the clinic’s first class of the day — Recovery in Progress. Attendance at Recovery in Progress — like all clinic classes — is rewarded with a bus token, which serves as an incentive to draw those who might otherwise not attend drug and alcohol recovery treatment. Bus tokens are valued items among the homeless, who get around primarily on foot. Clinic clients also have been known to sell or trade the tokens, which are worth $1.25. According to the National Health Care for the Homeless Council, it is estimated that of the 2.3 to 3.5 million people who are homeless in America each year, about half are dealing with or have a history of chemical dependency. In 2005, the Good Samaritan Homeless Clinic served 1,964 homeless patients, 67 percent of whom were using or had a history of drug use, making drug education and drug counseling essential to its multidisciplinary approach to meeting the health-care needs of the homeless in Dayton. 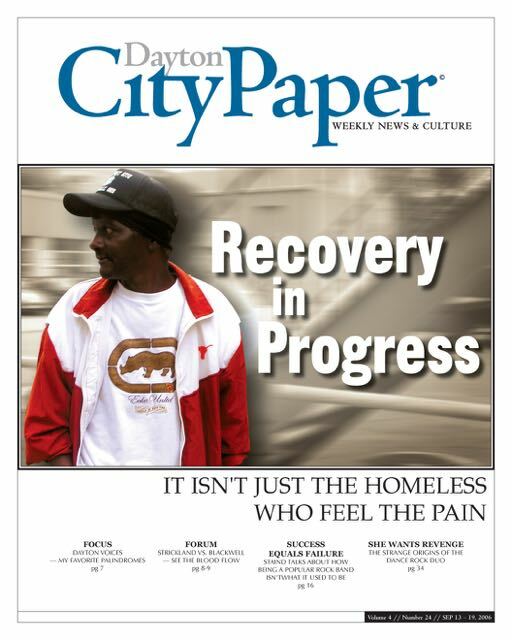 Homeless persons face unique obstacles to recovery, says Janet Housenick, one member of an 18-person full-time staff who has worked at the clinic as a licensed social worker and chemical dependency counselor for five years. Program Coordinator Judith Barr said it’s important to remember that health care isn’t a priority for the homeless. Basic survival needs such as obtaining shelter and sustenance take precedence and must often be sought without the aid of transportation or extensive social networks, a day-to-day grind often made even more challenging by mental illness and addiction. Because it's near the end of the month, the classroom is full. Here and there on tables sit Styrofoam cups of coffee given out before the morning class. Many of the men seated at the long tables have their possessions in book bags or gym bags on the floor by their feet. Today, there are more people than can fit at the tables, and so at the end of the room people sit in a group of chairs. In one of these chairs sits Forbus, a thin man, 51 years old, his hair frosted gray and his eyes jaundiced. With only three teeth, his lips are sunken. Like 74 percent of Healthcare for the Homeless clients, Forbus has no health care resources, and like many who find themselves here for class, he has had his own struggles with drug and alcohol addiction. Statistically, he is a typical case. Of those who receive aid from HCH projects, 30 percent are over 45, and 64 percent are ethnic minorities. Forbus is also an Army veteran and a father of six. If you ask him how he came to be homeless, you’ll find the details are a little sketchy. By his own account, he has been homeless for 10 years. Ten years ago, according to Forbus, he lived in a six-bedroom home on Cornell Street with his girlfriend and four children. His landlord, for whom Forbus worked for doing landscaping and cleaning, would sometimes not charge him rent. Although at the time, he and his girlfriend were regularly smoking crack, he said, it was only when the landlord decided to renovate the house that the trouble started. The renovation proceeded room by room. The city found the house in such a state of disrepair that it condemned it. Then Forbus lost his children to Children Services. In the years that followed, Forbus alternated between staying with his sister or friends and living on the streets, sleeping under overpasses, bridges, or in abandoned cars or buildings. Forbus claims that, in all those years, his only significant health problem was his rotting teeth. Even then, however, he said he didn’t seek out health care, preferring instead to pull them himself with a pair of pliers, getting drunk beforehand to lessen the pain. Social worker Mary Collins addresses the class from the front of the room, where she stands in front of a dry-erase board. Next to her on the wall is a poster listing the 12 steps of recovery, some of which have been circled with a marker. On a Friday, Collins doesn't want the day’s class to be issue-related. Sometimes, discussions of issues can lead to arguments, anxiety or worse. She worries that, should this happen, there will be no support afterwards because the clinic closes at 2:30 p.m. and will not reopen again until Monday morning. So she had arrived to the class armed with two PDF documents downloaded from Recoveryskits.com, a website that provides skits promising to “spice up your next AA meeting or other recovery-related function!” One is titled “Drinks With Wolves,” while the other is “Alcoholic Dragnet.” Collins’s idea is to have her classes perform the skits. Before the class, she was excited about the idea but also slightly apprehensive. For those like Collins and Housenick, intimate contact with the devastation of homelessness — the horror stories about broken families and wasted lives — can take its toll. Termed variously as secondary trauma, vicarious trauma, or compassion fatigue, it is an occupational hazard for HCH caregivers. And, according to NHCH Executive Director John Lozier, it's the very traits that draw individuals to the field that make them particularly susceptible. Typically not as well compensated as their counterparts in other areas of health care, HCH caregivers not only find themselves dealing with clients who frequently miss appointments and are often manipulative and needy, they must also do so with inadequate resources and understaffing. The Samaritan Homeless Clinic is no exception. Early this year, while already in the position of having to turn away potential clients because of a lack of resources, the clinic lost funding at the national level from the Department of Housing and Urban Development, necessitating staff cuts and further limiting the clinic’s hours of operation. Recently, Housenick, who at 58 is nearing retirement, has cut back from 80 to 72 hours a week, and is looking forward to working fewer hours in the future. In all, she has been at this for 18 years, having previously spent 13 years as a chemical dependency counselor with Nova House in Dayton. In the Recovery in Progress class, Collins has little trouble finding volunteers to play the six parts in the first skit. In “Drinks with Wolves,” a parody of the 1990 Kevin Costner film Dances with Wolves , the characters all have names like "Barfs Like a Buffalo" and "Argues with Sponsor." One of the volunteers tells Forbus he should play the last unassigned role, Farts Like a Moose. “It’s a small part,” Collins adds. Forbus declines, saying he can't read. One of the others overhears and asks loudly, “Who said he can’t read?” When he sees Forbus smiling sheepishly, he laughs. Forbus nods his head and laughs along with the rest of the class. Eventually, another man in the class volunteers to read the part. The skits are ridiculous and funny, and the class cracks up each time someone flubs his lines, which is often. The men get even more laughs by hamming it up. Collins stands at the back of the class, watching with satisfaction. Things are going well. However, not everyone in the class is caught up in the moment. Several watched vacantly, not laughing, arms crossed. One man stares at his lap. Another man is clearly sleeping. He has the brim of his ballcap pulled down over his eyes. After the first skit is finished, Collins asks who in the class wanted to act out the next skit, “Alcoholic Dragnet.” This time, Forbus volunteers. Later, when Forbus is outside the clinic smoking a rolled cigarette, someone asks why he said he wouldn’t read the first time he was asked. He laughs and saya he was shy, but that he really enjoyed the class. His whole reason for coming to the homeless clinic today is to get the bus token, but he thinks he might actually be getting something out of the classes. The relationship between substance abuse and homelessness is not well understood. Unsurprisingly, substance abuse is widespread in the homeless population. A 1997 study by the Alcohol Research Group of the Western Consortium for Public Health found that the incidence of substance abuse among homeless adults is more than eight times higher than is found in the general population. Frequently cited as a cause of homelessness, substance abuse traditionally has been thought to increase in adults who become homeless. However, a 2004 study by the Johns Hopkins University School of Medicine suggests that, for the majority of adults who become homeless, levels of substance abuse, rather than increase, remain the same or diminish, though this is attributed more to a lack of resources than a conviction to cut back. What is more, substance abuse complicates medical conditions and their treatment, which makes treating the homeless particularly difficult, since someone who is homeless is likely to seek health care only after a medical condition has advanced to the point where it intrudes on his or her ability to meet basic survival needs. Good Sam works hard to guard its clients’ anonymity, and homeless persons are not eager to discuss their hardships with outsiders. Of those who consent to be interviewed, few are completely forthcoming, and much of what they say is difficult to verify. Bring a camera to the large group that gathers each weekday morning in the parking lot adjacent the clinic and you stand a good chance of being greeted with anger and suspicion, if not outright threats. But spend a few days talking to the homeless and the caregivers that treat them and you will find that, in spite of everything, pity is in short supply. Caregivers approach their work with a resolve and pragmatism that tempers their empathy. As for the homeless, it is a luxury they cannot afford. In the end, even Forbus can muster little pity for his associates.